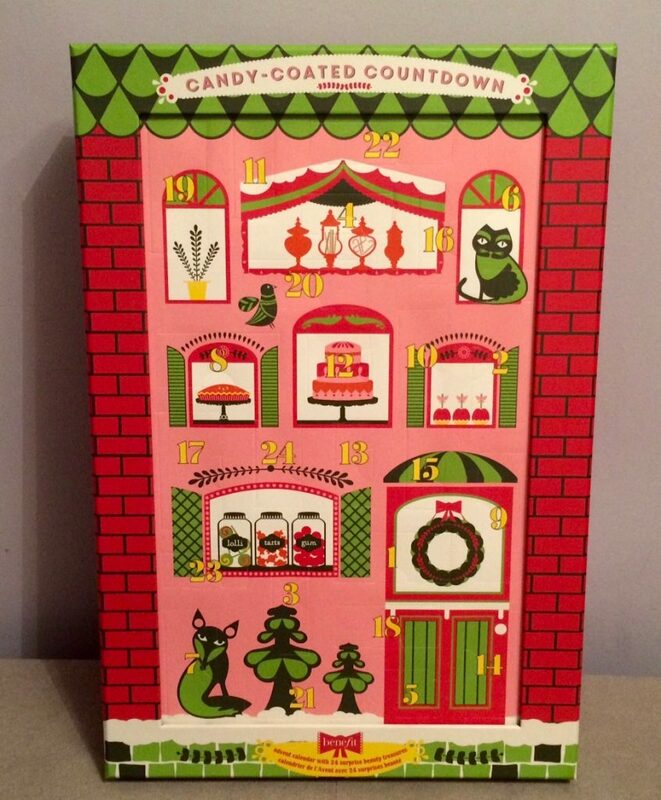 Just 2 more days till December and 2 more days to get through before I can begin opening the doors to this years Benefit Cosmetics Advent Calendar, Candy Coated Countdown *cheers*. Last years advent calendar, Countdown to Love (right) sold out in a matter of seconds after hours of their website failing, and they had none in any Debenhams shops remotely near us. I was however lucky enough to get my hands on one (thank you to my friend in the US!!). I loved last years but then I must confess I am a Benefit addict, I cannot go near a Benefit counter without looking and usually buying something! 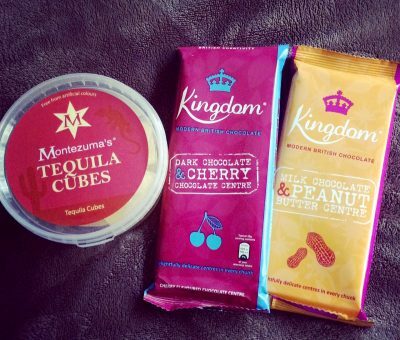 Countdown to Love had a great selection across the board of the products that they do, and allowed you to try miniatures that you are unsure of, or know that you wouldn’t use all too often and don’t want to fork out ££s for. They also had mini accessories which was a nice touch but not all that in quality. Yes like anything there are things that you don’t always use, but I have used pretty much all the items from last years and actually led me to buying the full size ones, so all in all worthwhile. 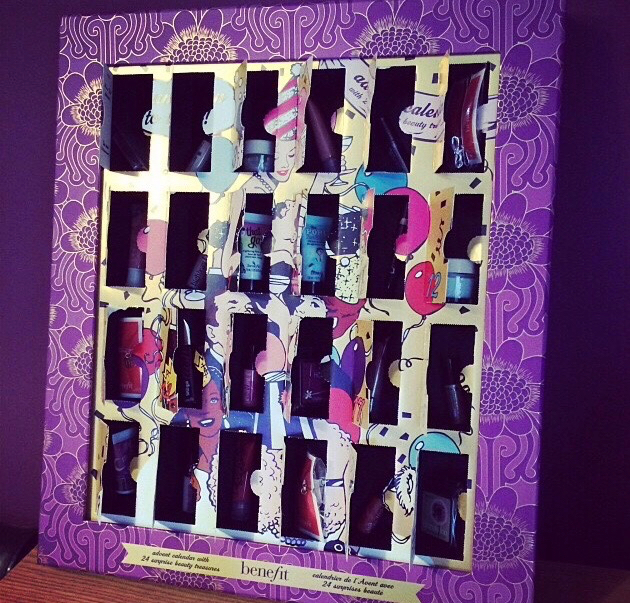 Chocolate Advent Calendars seem to have taken a back step this year and beauty advents are taking the retail scene by storm. This years calendar Candy Coated Countdown, as expected sold out rapidly online. If I am honest I wasn’t too sure on getting one this year, but they were stocking 20 in my local Debenhams and I couldn’t resist. I am glad I did because I knew I would have regretted not buying one. Benefit were definitely more prepared this year by ensuring more stores had stock. What was also nice to see was that they didn’t hike up the price, which to be fair is what I expected given last years sellout; coming in at £60 it still isn’t cheap but to be honest if you are going to use the items or want to have or try lots of little mini products, they don’t exactly go out of date, so it really is worth it! I can’t deny I am excited for this years calendar, however if I am honest one of the draw backs is that they list each of the products that are included. Although you don’t know what is behind each specific door, there is still an element of surprise missing. Anyway roll on Monday I am dying to start opening those doors and of course I will keep you posted! If you have a beauty calendar of any kind or have any views on them please feel free to comment, it would be great to hear from you.